Whatever your feelings were about the election, these brownies are a perfect response. They will surely cheer you up if you are unhappy about the results (chocolate always improves things! ), and serve as a tasty victory dessert if you are happy about the results. We look forward to voting in the next election! Politics aside, let’s talk about these brownies. 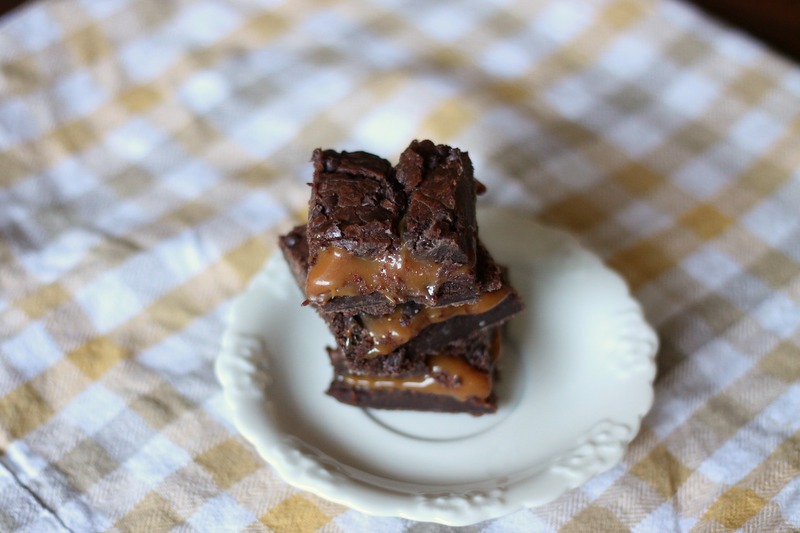 They are probably the fudgiest, most decadent brownies imaginable, with a layer of gooey caramel in between. We wanted to make these to use up a bag of caramels that was tempting us, and send them to our brothers’ cross-country team party. Well, they didn’t end up going due to a couple of reasons, so we were left with an entire pan of these to ourselves. A couple of words of advice: if you’re serving 10 people or less, we recommend making a 1/2 batch because these brownies are so rich and filling. Also, to set them up properly so that the caramel doesn’t ooze everywhere, we recommend refrigerating the brownies until totally cooled, and then let them sit at room temperature for about a half hour so that they can be cut easily. Have a big glass of milk nearby to wash these down, or some vanilla ice cream! Preheat oven to 350. Line a 9×13 inch baking pan with foil and spray with nonstick cooking spray. Melt butter and chocolate in a pan over low heat until smooth and completely melted. Remove bowl from heat and whisk in eggs, flour, and vanilla extract. Stir in flour and salt and mix until just combined. Pour half of the batter in prepared pan and bake for 20 minutes. Let cool for 2o minutes before pouring on the caramel. In the meantime, melt the caramels with the cream/milk until smooth (add half of pecans here, if using). Pour over brownies. Top with brownie batter, distributing as evenly as possible, as it is hard to spread the batter over the caramel. Top with chocolate chips (and remaining pecans, if using). Bake 20 minutes, or until top layer of brownie is moist but set. Let fully cool before slicing. Enjoy!